Dental implants are artificial teeth that function just like your natural teeth. They’re a long-term solution for people who have lost one or more teeth. The dental implant functions by replacing the tooth, while increasing stability and durability. 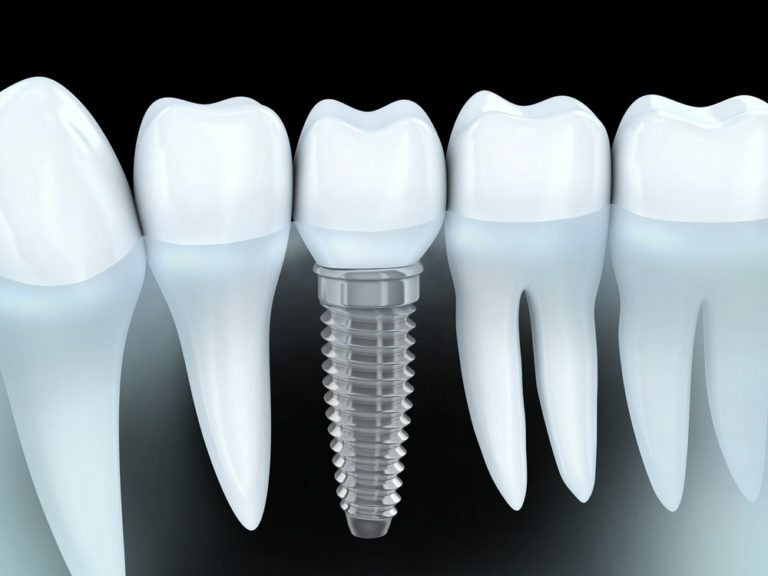 A dental implant is a titanium post that is placed into the jaw bone to replace the root of the tooth. This is eventually where a permanent crown will be placed to allow your mouth to function normally. The implant plays a crucial role in preserving your facial structure and the function of your mouth. The dental implant also preserves the bone around the area and bone deterioration is prevented. We know comfort and convenience are important to you. We offer modern implant surgery with the latest advancement in technology. Using 3D imaging we are able to have digital panoramic views done for a quick, efficient and comfortable diagnosis. This leads to precise treatment planning for dental implant placement. All of our implant patients surgeries are first planned with a “virtual surgery” using integrated software for precise placement of the crown and to minimize the risk to the surrounding vital structures and nerves. Then using CAD-CAM technology, the information is transferred to a surgical guide that is used during your implant surgical procedure. Dental implants help restore a patient’s quality of life. They can enjoy laughing, eating, talking, and even kissing like they did before they lost their teeth. Implants give a patient a great quality of life that is much like what they had when they had their natural teeth. Dental implants have been proven to be an effective and ideal choice for patients. Dr Miyamoto has been placing implants for over 25 years. She uses Straumann implants which have long-term reliability, safety and efficacy. She also uses a special software to plan exactly where the implant will be placed and uses a custom made surgical guide. Implant dentistry has revolutionized how dentists deal with tooth loss. Implants function like normal teeth and do not have to be removed to be cleaned or slip when you’re talking, a common complaint of those who wear dentures and bridges. If you’re missing a tooth or have several teeth that are missing, you might be a candidate for dental implants. A consultation, as well as special x-rays, will help determine if you have enough bone to support an implant. If you do not have enough bone, a bone graft may be required. What types of technology is used for dental implants?